Todays satellite image shows the clouds along the west coast sliding northwards, and the projected vortex forming over Mumbai.The city got very heavy rain on Thursday, 194 mm at Colaba.All along the Maharashtra coast, heavy rains were experianced. Many places along the Karnatak/Goa/Maharashtra coast recieved rainfall ranging from 100-200 mms. This may last for a couple of days more in Konkan/ Mumbai, with Saturday getting a few more heavy showers, and tapering off on Sunday. For Mumbai: Saturday: Heavy passing showers around noon, and evening. Cloudy throughout, with a high near 30. Chance of precipitation is 100 percent with rain amounting to 70 mm. Sunday: A chance of fewer showers,tapering off after noon. Partly cloudy later, with a stray shower, and a high near 31. Sundays rain would be lesser at around 20 mm. For golfers, Saturday will wetter than Sunday. An umbrella will be ok on Sunday, if you dont mind the slush. The anticipated low-pressure area has formed over the Bay of Bengal off the Orissa coast. The system is likely to become more marked during next two days, before crossing the coast, according to predictions by international models and IMD. Hence, Sunday to Tuesday will see an increase in rainfall activity over eastern coastal regions. As the system moves westwards, and inland,from Sunday onwards, it will precipitate along the west-north-west track from east India covering southern Bihar, Jharkhand, Chhattisgarh, Madhya Pradesh, and later, Rajasthan and adjoining Delhi, Punjab. 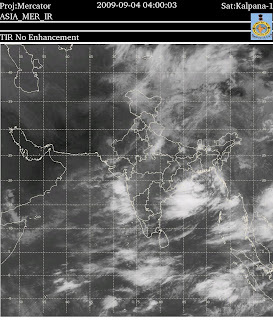 Yesterday, a western disturbance moved in over Punjab and Kashmir regions. ( mentioned in the previous blog). Resultantly, a trough in the north-west has made formed. 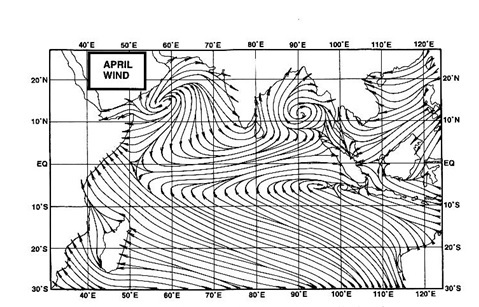 This westerly trough, a sign of increasing "winter like" formations, can precipitate rain over north and north-west India, much like the "normal" W.D.s do in winter. I mention this, as i see this as a first sign of winter systems" taking over' in the north. After these rains, I see the monsoon withdrawing after the 13th. in north Gujarat and Rajasthan.